Critical minerals may sound like a new security topic, but as these photographs show, such supplies have always played a major role for the nation. Scrap metal and aluminum drives of the early 1940s took place as a result of mineral shortages before and during the U.S. entrance into World War II. Today, both military and civilian technologies depend on an even wider array of mineralogical resources, some of which exist in no known quantities in the United States. In fact, the National Defense Stockpile reports that of 13 critical or strategic minerals, the United States is fully import dependent on five. In the future, can we expect national collection drives for gallium, tantalum, and indium to support U.S. defense activities, the way previous generations lined up to donate rubber, aluminum, and steel? Photos: (1) Two boys support the war effort at a heavy price, by donating their toy car. Courtesy of flickr user theirhistory; (2) Undergraduates at Duke University collect rubber and tin. 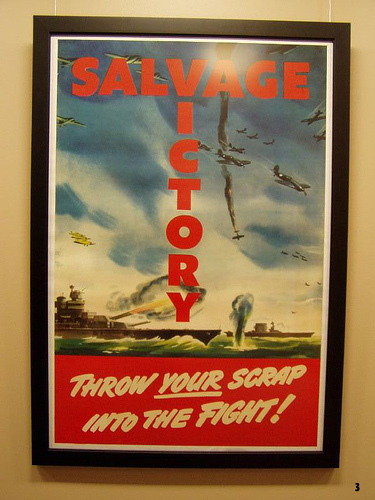 Courtesy of flickr user Duke University; (3) A World War II propaganda poster urges citizens to donate metal scraps for use as war materiel. Courtesy of flickr user sunfell. Photographs are as valuable as words in explaining the natural security challenges the nation faces. The CNAS Natural Security Bloggers will post a Photo of the Week every Friday. Check back each week, and send us your photo ideas!